The Pulse Oximeter provides fast, reliable SpO2 and pulse-rate measurements on any patient from infant to adult. 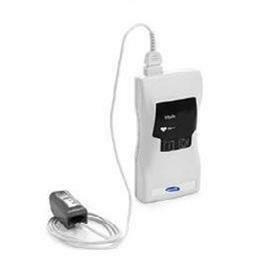 It's designed for simple, accurate spot-checking and is a member of a full-line of pulse oximetry products offered by Invacare.Bright, easy-to-read LED numerals - Storage up to 99 patient SpO2 and pulse readings. Printer interface for documentation of live or stored patient data. Quantitative pulse-strength bar depicts actual signal strength for a true indication of pulse strength and perfusion status. Three "C" cell batteries provide power for 1,500 spot-checks. Variety of reusable and disposable sensors available.